1. Check each bulb to see if they are fully inserted into the socket. This is the most common cause for lights not lighting. A light set will stay lit with a bulb burnt out, as long as the bulb is still fully in the socket. For lights where you can take the bulb out of the socket to stay lit, you will need to have the bulb either fully in the socket or fully out of the socket. If it is not fully in or out, it will cause a light set to not be lit. 2. Are the bulb wires making proper contact? Remove the bulb and adjust the wire if necessary. If neither of these solves the problem, then you may want to try one of our Light Keepers or another one of our light testing items. 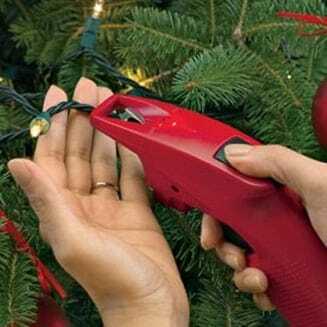 The LightKeeper Pro is a powerful tool for fixing strings of lights and can save a family a bundle on replacing strings that just need a quick fix. It can detect faults in a wire, clear issues that prevent strings from staying lit after bulbs burn out, and even test bulbs and fuses for quality. All of this is available in a single hand held device. Below is the basic use of the device in its normal functioning. 1. Quick Fix Piezo Trigger: An easy-to-use system for repairing faulty bulbs, the Quick Fix Trigger sends an electrical pulse through a defective light set, repairing problems associated with defective shunts. 2. Continuity Detector/Voltage Detector: When the LightKeeper Pro's Continuity Detector/Voltage Detector scans a defective light set, it will indicate where a power interruption occurs, helping you find the area needing repair. 3. Bulb and Fuse Tester: The Bulb Tester, built into the top of the LightKeeper Pro, offers a third way to repair your light sets. You can individually test miniature light bulbs. Working bulbs inserted into the tester will illuminate immediately, indicating they are functioning properly. The Fuse Tester is designed to check 3 amp fuses supplied with most miniature lights. Place the fuse in the Fuse Tester. If the fuse is good, the red light on top of your LightKeeper Pro will illuminate. 4. Bulb Puller/Remover: Bulb Puller/Remover: The Bulb Puller makes it easy to remove those stubborn hard to get out bulbs. Two different bulb pullers are designed into the LightKeeper Pro: a Conventional Puller and a Hook and Pull remover. 5. Storage Organizer: The built in storage compartment helps you organize and store the extra bulbs and fuses that come with most light sets. It has slots for 2.5 volt bulbs, 3.5 volt bulbs and fuses. Each is labeled to accommodate the free extra bulbs and fuses included with the LightKeeper Pro. 6. LED Light: Light in the tip helps illuminate in dark working areas. Volts (V) measure the force (strength) of electricity. Amps measure the amount of electricity used. 250 Mini 2.5 volt bulbs = 1 amp. Wattage is the best way to tell you how many sets of Christmas lights you can connect end to end. Watts measure the work electricity does per second. How many volts, amps, and watts are in incandescent mini light sets? NOTE: The average outlet in a home has 20 amp service. NOTE: Voltage is never more than 120 V for these light sets. The standard house service is usually 120 and is the industry standard for most mini light sets and complies with UL testing. We list bulb voltage to ensure consumers use the correct replacement bulbs. WHAT TYPE OF FUSE DOES MY LIGHT SET USE? Incandescent Mini Light Sets use 3 amp fuses. Heavy Duty light sets 5V use 3 amp fuses. C7, C9 light sets use 5 amp fuses. G40, G50 light sets use 5 amp fuses. Most non-replaceable LED sets use 3 amp fuses. It is always best to check the packaging or labels to find out what type of fuses your Christmas light set or Christmas tree uses. Extension cords come in all shapes and sizes. However, it is wise to be as careful as possible in selecting the best one for your purposes. Some extension cords are meant for indoor use only, which the packaging may not clearly state. Check the sticker on the cord itself for more accurate information. Additionally, it is important to note ahead of time the amount of electricity your extension cord can handle. If you plan to have heavy-duty lighting, or large numbers of connected devices, you will need a heavy-duty cord. In this case, both the length and gauge are important. The higher the gauge, the thinner the wire or cord, and the less amperage it can safely handle. 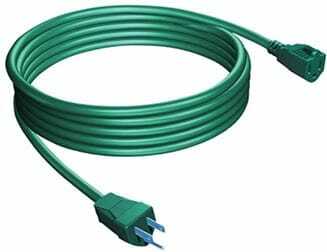 Also, the longer a wire becomes, the less amperage it can hold as well, so always use the shortest possible extension cords you can if you are doing large-scale lighting. Generally, standard lights have a thinner, lighter wire connecting them. They are slightly less hardy and resistant to damage, and in general have a lower limit for the number of bulbs you can connect end to end. Commercial lights are made to meet specifications set by professional decorators. They are tougher and a bit bulkier than residential lights. Some are made in a sealed single-cast construction, so the bulbs cannot be removed. Although they cannot be replaced in this case, they are sealed to the point that they could be submerged in water without ill effect (we do not recommend this, of course). While it varies from light set to light set, on average commercial lights can have more sets linked end to end without having any electrical issues. On the other hand, commercial sets often have less space between bulbs, to make a shorter, more compact set, so you may find yourself needing more sets - which will cost slightly more - to cover the same area. Each light set has its advantages, so decide for yourself which would work best, based on your needs for the year. Turning your Christmas lights on and off can be an easy task, but it’s also easy to forget about. With an electrical timer, you can always be sure that your lights are turning off and on when you want them to. Christmas light timers come in several forms and levels of complexity. The simplest ones are set on a delay for a number of hours and repeats each day. More advanced models are fully digital timers that allow for the programming of schedules and specific on and off times. 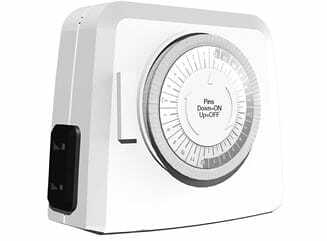 A similar device that we offer is the remote control activator. This device can be activated by a wireless remote, allowing for extra freedom in controlling devices and lights that normally would be in an inconvenient place to activate. Underwriters Laboratories Inc. (UL) is an independent product safety certification organization that controls and monitors lighting rules and safety regulations. A “UL-approved” designation means a product has been approved by this agency. UL has developed more than 1000 Standards for Safety. Its Standards for Safety are essential to ensuring public safety and confidence, reducing costs, and improving quality. Millions of products and their components are tested to UL's rigorous safety standards with the result that consumers live in a safer environment than they would have otherwise. CSA stands for Canadian Standards Association. CSA certifications are used and accepted across North America and around the world, on over 1 billion products. And that number continues to grow. In the United States, CSA International is accredited by the Occupational Health and Safety Administration (OSHA) as a Nationally Recognized Testing Laboratory (NRTL). Generally speaking, all OSHA accredited laboratories conduct their tests against the same sets of U.S. standards and codes, regardless of who authors or publishes them. CSA International tests are applicable to U.S. standards, which include ANSI, UL, CSA, NSF, and others. In Canada, CSA International is accredited as a Certification Organization (CO) and as a Testing Organization (TO) by the Standards Council of Canada (SCC).